The Radium Engineering Port Injection Kit (PIK) installs between the intake manifold and the cylinder head and permits the use of port injectors to add additional fuel for high-horsepower Ford EcoBoost engines. This kit does NOT replace the OEM direction injection system. 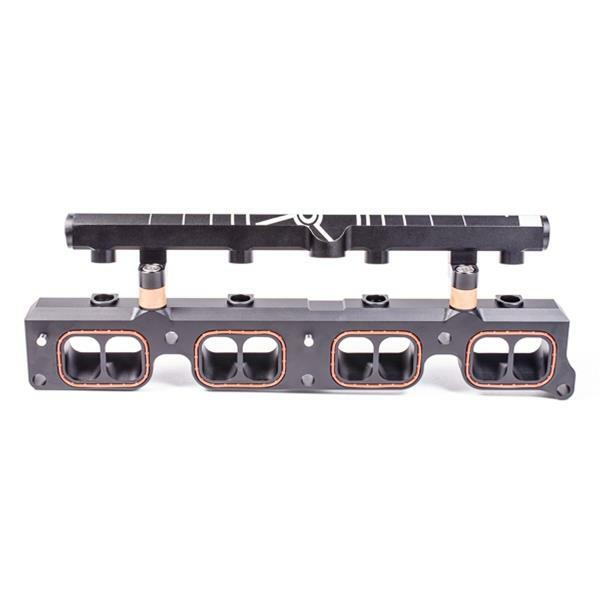 The kit includes the PIK adapter plate, custom fuel rail, fuel rail mounting hardware, and OEM Ford gaskets, as shown in the below picture. Stainless steel dowels are pressed into the adapter plate to make alignment during installation easier. It is compatible with all fuel types including popular alcohol mixtures such as E85. The 6061 CNC machined aluminum adapter features a smoothed port divider promoting laminar flow into the combustion chambers. The injector spray pattern is divided evenly into each runner. The angled air flow passages through the PIK adapter plate are CAD matched to the intake ports and manifold to minimize any impact to air flow through the ports. The fuel rail features a large 0.69” internal diameter bore. It is CNC machined from extruded 6063 aluminum and laser etched for a high quality surface finish. All 3 ports (ends and center) are machined with an 8AN ORB (3/4-16 female) port. Machined phenolic mounting spacers and washers are included to completely isolate fuel created by the cylinder head and transferred through the mounting bolts. The injectors are at a max angle to ensure proper spray into the ports. Special CNC machined aluminum adapter brackets are included to relocate the mounting grommets. This allows the OEM Ford Focus Engine Covers (ONLY) to be reused for a stealth appearance. This kit is designed for specific upper and lower O-ring spacing, as depicted below. The upper and lower injector O-rings must be 14mm diameter. Consult the fitment guide before purchasing injectors (Radium does not sell injectors). NOTE: Fuel injectors, port fittings, fuel hose, wiring, injector controller, etc. are NOT included and must be sourced elsewhere.